AllegroMedical.com presents The Comfort Audio Contego FM HD Communication System with Neckloop. Comfort Audio's Comfort Contego is a wireless, digital, secure high-definition FM HD sound communication system for hearing aid users with a t-coil. This version includes a neckloop. Achieve up to approximately 40dB amplification at 1kHz. The flexibility of this system allows an unlimited number of additional receivers to be used with one transmitter (additional receivers available separately), making this an ideal solution for guided tours, classrooms, courtrooms, etc. Both the transmitter and the receiver have built-in microphones that can be set for omnidirectional or directional depending on the environment. Working range is approximately 100 feet depending on the type of environment you're in. It can achieve up to 20 hours of use (under normal conditions) after four hours of recharging. The Contego uses Li-Ion rechargeable batteries. This Contego system comes with a neckloop for t-coil hearing aid wearers. A Contego system with earphone and headphone is available. Two year warranty. Six month warranty on accessories. Custom Sound - Comfort Contego provides maximum flexibility in all situations. Both the transmitter and receiver have internal zoom microphones that can be remotely adjusted for omni or directional use and volume setting. Maximum Functionality - Comfort Contego is the basis for a total sound solution for individuals with hearing loss. 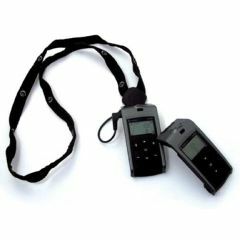 The transmitter can be used with multiple receivers to create a secure hearing system. The receiver may be used alone as a personal listener by activating the built-in microphone. Comfort Contego can be linked to a television, sound system or other sound sources. It can be used with a neckloop (included) or with a headset or earbuds (not included).